Please click here to see current availability, prices, payment options, photos and other information regarding Scottsdale Camelback Resort condo vacation rentals. The spacious 3BR Barcelona two level villa for 8 people has 1381 sq feet and comes with a king bed in the master bedroom, a queen bed in the second bedroom, and 2 twin beds in the third bedroom, and a queen sleeper sofa in the living room. The condos have a full kitchen, large living area with flat screen TV and fireplace, two bathrooms, one with spa/jetted tub and shower and one with regular tub, washer and dryer, and patio or balcony. The condos are bright, open and well-built, with plenty of exposed brick.complete with living room, dining room and full kitchen. 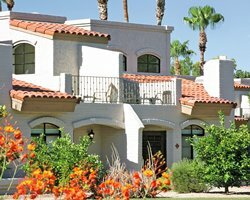 We have access to many condo vacation rentals weeks at the Scottsdale Camelback Resort, so if you don’t find what you want here, please inquire about your specific dates or search and enjoy for the week you want.